I have an orchid I would like to identify. I have these growing in pots, as well as in the ground outside in Austin Texas, where they have been growing for about 40 years. 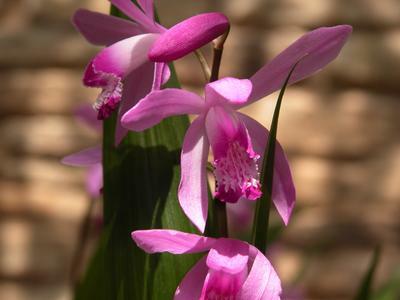 The original specimen was collected in the Beaumont, Texas area, perhaps 60 to 100 years ago, and was called "Piney Woods Orchid" by the family that originally collected it in the woods near the family home. The plants grow from pseudobulbs that are about an inch to an inch and a half in diameter, and have large leaves 2" across with pleats, growing a foot to 18 inches long. The flower stem originates in the center of the leaf cluster, typically producing about half a dozen flowers per stem. The original habitat is a sandy shaded area dominated with pine trees, with a somewhat swampy climate with high levels of rain. They are thriving in a space where they had dappled sunlight and very little water. In a test I was able to successfully transfer them to flower pots where they continue to thrive with 4 or 5 hours of sunlight. An attempt was made to give them shade, and they insisted on leaning into the direct sunlight (even though I was told the sun would kill them) They seem to be much hardier than I was told they would be (that or they just like the conditions I provide). It looks like these are Bletilla striata (Chinese Ground Orchid). Is it possible that these were not collected in the Piney woods at all, and actually originated in China?